Jebb was born in Derbyshire in May 1793. He attended the Royal Military Academy at Woolwich and was commissioned as a second lieutenant in the Royal Engineers on l July 1812. He was promoted to first lieutenant the following year and embarked for Canada. He served on the frontier of Lower Canada until the summer of 1814, when he was transferred to the United States and took part in the battle of Plathsburg under Lieutenant-General Sir George Prevost. He returned to England in 1820. He was stationed at Woolwich and Hull until December 1827 when he embarked for the West Indies and was promoted second captain. In 1829 he was invalided home, on recovering his health he was posted to Chatham to the Royal sappers and miners, and promoted first captain in 1837. In 1837 as a result of William Crawford's report on the prison system in America, the Home Office decided to appoint a surveyor-general of prisons in order to have a technical advisor on the construction of prisons. Jebb was given the post on secondment from the army. He was employed in designing county and borough prisons, and worked closely with the two Prison Inspectors, Rev Whitworth Russell and William Crawford, although there was no love lost between the three of them. From 1839 his services were entirely devoted to civil work, and he was appointed to oversee the design and construction of Pentonville the `Model Prison'. What is interesting in the fortunes of these three key players (Jebb, Russell and Crawford) is the central role Pentonville was to play in the outcome. 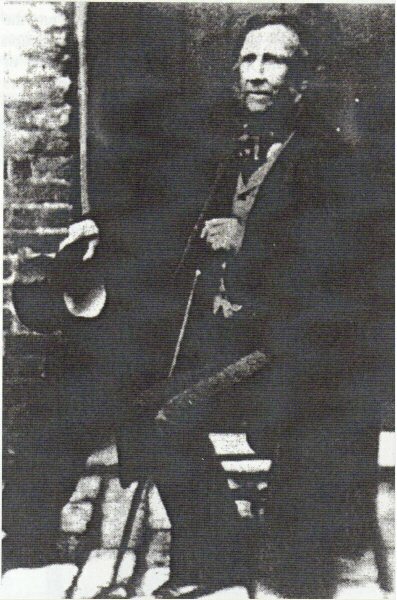 In 1834, 6 years before he obtained his first major appointment, Jebb was an unknown army officer. Crawford on the other hand was well known for his work and interest in prisons. He was born in 1788, 5 years before Jebb and was involved in prison reform from 1815, when he assisted Elizabeth Fry brother-in-law's, T.F. Buxton and Samuel Hoare, to found the Society for the Reformation of Prison Discipline. Thereafter he regularly visited London prisons and became a friend of the Hon H.G. Bennet, the Whig's leading spokesman on prison matters in the House of Commons. He drew to the attention of the Home Secretary the work of Crawford, whom he described as a very intelligent and respectable young man of the City, who instead of passing his time in pleasure is spending his fortune in public duties with the poor, destitute and friendless. As a result, in 1833 Lord Melbourne chose Crawford to visit the United States to see what was happening there and in particular in Philadelphia and the work of the prison architect John Haviland. In 1835 the House of Lords Select Committee on Goals and Houses of Correction sat for many days under the chairmanship of the Duke of Richmond. One of the first witnesses was Crawford. One of the other witnesses was Whitworth Russell, then Chaplain of the General Penitentiary at Millbank. He was little known, having been in the post for 5 years and having graduated from Cambridge in 1818. Arthur Griffiths, at one point Deputy Governor at Millbank, commented sarcastically of Rev Whitworth `The prayers, expositions and genuflexion's were more in keeping with a monastery than a goal full of criminals'. One of the principal recommendations of the Select Committee was that government inspectors should be appointed. This was acted upon by the Act of 1835 and the Home Secretary, Lord John Russell appointed Crawford as one of the inspectors, and more surprisingly Whitworth Russell as the second. It is alleged that his monastic approach appealed to the Home Secretary. Their terms of reference were: "In the examination of the several prisons visited by you it will be proper that you should direct your attention to every part of their government and internal discipline, and more particularly that you should inquire into the nature and effect of the arrangements which may have been made with reference to the following points: The construction, site, and neighbourhood of the prison; its security; means of separation; power of inspection the prisoners; cleanliness, ventilation, dryness, temperature, and dimensions of the principal parts of the buildings, and especially of the night apartments or sleeping cells." The two inspectors became convinced that the separate system was infinitely preferable to the silent system, and persuaded the Home Secretary that any new prison constructed should encompass the separate confinement system. In September 1837, Captain Joshua Jebb was given a 6 months attachment to the Home Office to give assistance with any problems relating to plans needed for the introduction of the separate system. He clearly made his mark, for at the end of the 6 months; he was advised, "For the present Lord John wishes your appointment to continue." The Home Secretary having been convinced about the separate system, after some difficulty, got Parliament to pass the 1839 Act. This provided that no cell should be used for the separate confinement of any prisoner unless it complied with certain basic requirements and until it had been certified by an Inspector. 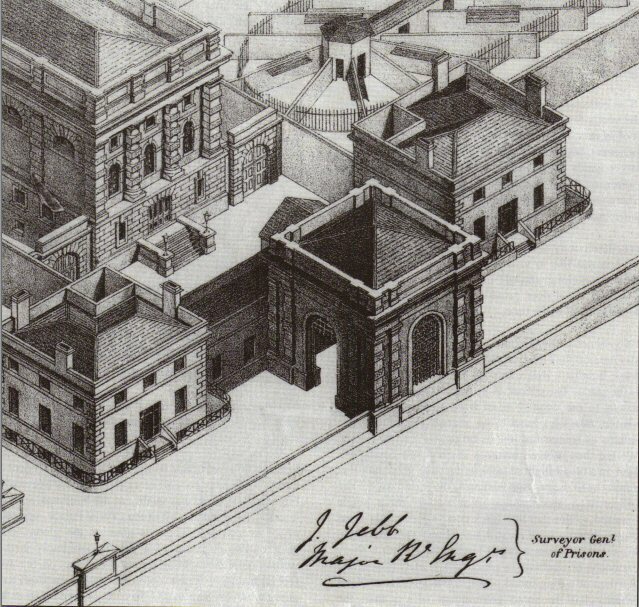 Jebb was asked to select a site for a new model prison to show how the separate system could be made to work. On August 28, 1839, he wrote to Phillips to ask for an interview with Lord John Russell to discuss the plans. Russell endorsed the letter, "I will see him at the Home office on Monday next at one." It was probably at this time that Jebb decided that his future lay with the Home Office rather than with the Royal Engineers, for three weeks later he was formally seconded from the Army. On September 19, Whitworth Russell wrote the first letter to Jebb which indicates that all was not well between them: "I feel very anxious that it should be clearly understood at the Home Office that you concur in our application to be associated with you in the revision of plans submitted to the Secretary of State for his sanction. You do concur in the application with reference to the Model Prison, and your scheme as regards the other matter may be interpreted into a disinclination on your part to our interference." Crawford wrote to Jebb in the same vein on the same day. Before the building of the model prison could start Jebb had an involved search for a suitable site. At one stage he discussed the purchase of some land which turned out not to belong to the proposed vendor. The Home Secretary was not pleased. On October 4, 1839 Jebb wrote a long letter of explanation to the Home Office, ending: "I may plead being wholly unused to transactions connected with the transfer of property; but still I shall beg distinctly to state that all the blame of the mistake that has been made rests with myself." A pencilled note on top of this letter reads: "This explanation is not satisfactory, but Capt. Jebb is so zealous an officer and is so dutiful with the whole affair, that we must smooth it over." In the following month, on November 22, 1839, Jebb wrote to Phillipps about pay which gives an indication of the fact that he was considered to be on a par with the Inspectors. After pointing out that the Home Office work "deprives me of all those opportunities of service by which alone I should have an opportunity of advancing myself in my profession", he added the following plea: "Having hitherto been on the same footing as the Inspectors of the Home District with whom I am associated, I trust also that my claim of being continued on that footing will be admitted." The building of the model prison at Pentonville, to the designs of John Haviland as approved by Jebb, took from April 1840 until December 1842, when Jebb and the two Inspectors (together with Lord John Russell and others) became commissioners of the newly opened prison. All three men worked extremely hard with very little help. In January 1840 Jebb had to ask for a room "in consequence of my not having any place in which the draughtsman, and others I have occasion to employ, can work". In July of the same year Crawford and Whitworth Russell were called upon to explain the lateness of the annual report. They pointed out that the 1839 Act had involved them in a large amount of additional work in checking and advising on new rules for various prisons. "At the close of the last year a packet containing more than one hundred sets of prison rules was received by us at one time." They added bitterly: "It has not been without much anxiety and labour - unassisted as we have been by clerks - that we have discharged these various and important duties." This letter, like most of the joint letters of the two inspectors, was written by Crawford personally. In 1844 Parliament passed an Act to provide for the appointment of a Surveyor-General of Prisons and Jebb was appointed. On August 10, Whitworth Russell wrote a letter which makes it clear that the relationship of the two men had been strained. "I trust I have too good a heart not to rejoice at your promotion, and I therefore cordially congratulate you on the appointment you have received. I should however be wanting in candour if I did not say I am as much opposed as ever to the office which has been created, and to the assignment of the duties, as I understand them. Whilst you feel the office essential to you as placing you in a better position for doing your duties, I complain that it places us and the public in a worse. The office, however, is now created by law, and the Secretary of State has conferred it upon you. I therefore cheerfully fall in with your wish that we should cordially cooperate, and I sincerely hope that there will be an end to all squabbles, of which I am heartily weary." Two weeks later, on August 26, Whitworth Russell wrote a long letter of complaint to Jebb. Jebb had sent a draft of his report on Pentonville and received the response: "I think that Crawford and myself are entitled to more than you have accorded us to in the draft you have sent. I have conferred with Crawford and he concurs fully in the opinion just expressed. It is a painful thing for men to state what they think due to themselves - it is most distasteful to write panegyrics of ourselves. We believe that we are entitled to have it stated that to Crawford and Russell is due the impetus that has been given to improved prison construction, as well as to improved prison discipline. So early as our Second Report in 1837 a full and careful article on prison construction was published, the principles of which are strictly the same as now universally adopted, although in detail there have been many changes and improvements." Whitworth Russell wrote several indignant pages on the same lines and concluded: "That `Justice to Ireland' must not absorb all Justice - Justice to Crawford and Russell also; Poor Russell needs some - for he had scant measure amongst you all - I leave the whole matter confidently in your hands." Jebb accepted the principal point made and in his report duly acknowledged the vital part played by the Home Inspectors. I cannot admit for a moment your definition of our respective duties." In 1847 Jebb was promoted to Lieutenant-Colonel, and continued as a commissioner at Pentonville Prison. In 1850 a post of Director of Convict Prison was created to overseer all prisons, and Jebb was appointed, and under his governance the progressive system was adopted generally and developed. Having served 10 years uninterrupted in civil employment, Jebb had to return to or retire from the army. He chose to leave the army in 1850. He subsequently received the honorary rank of colonel in 1854, and major general in 1860. He was made a KCB for his civil services in 1859. District has been obliged to withhold it. Much dissatisfaction has arisen from this circumstance, and in some cases association instead of separation has in consequence been adopted. We are also anxious to be spared the necessity in the discharge of our duties as Inspectors of Prisons of making comments with reference to a defective prison after it has been completed and all the expense has been incurred. We have always felt that the only way to avoid these inconveniences is to afford the Inspector of the District an opportunity of seeing and carefully considering the plans while in the course of preparations. We may further remark that our being kept in entire ignorance - as we have been - of the plans of new prisons in our District, is calculated to embarrass our proceedings with the magistrates in our visits to the prisons." A month later, on May 23, 1845, John G Perry, another Inspector, (there were five in all) wrote a similar letter to Jebb. Perry explained that he accepted the demarcation of areas, but felt it necessary on occasion to draw attention to defects in plans. In connection with work at Portsmouth prison he wrote: "I accidentally discovered in the progress of the building that all provision for ventilation had been neglected. I did not `interfere between you and the magistrates' but I privately drew your attention to the omission in time to enable you to rectify it." These letters suggest that Jebb was extremely sensitive about any comments from the Inspectors. His sensitivity may have been partly due to the fact that he was making a number of mistakes in his work. The bickering continued and on July 5, 1846, the Home Secretary, Sir James Graham, felt obliged to write to Jebb: "I could not fail to express my regret that angry differences should have arisen between public servants, whose cordial co-operation is necessary for the public good, and whose quarrels, unless speedily terminated, must lead to consequences which I should regret." The rivalry between Jebb and the Home Inspectors, if not terminated by the Home Secretary's intervention, undoubtedly came to an end in the following year. On April 22, 1847, Crawford, who had been ill for some time, died whilst on a routine visit to Pentonville. By a ghoulish coincidence his "partner" Whitworth Russell died on August 3 of the same year whilst on a visit to his old Penitentiary at Millbank, but his death was not of natural causes. Whitworth Russell shot himself. Shortly afterwards Joseph Kingsmill, the chaplain at Pentonville, who had also disagreed strongly with Whitworth Russell, wrote to Jebb: "Poor Mr. Russell's ruin was his ambition and a temper which could brook no check. It was also rumoured he had speculated on the railways and was worried about the expense of his daughter entering society life." In view of what we now know of Whitworth Russell it seems unlikely that he would have attained high office had he lived, despite his ambition and ability for hard work. Crawford had perhaps been "passed over" for promotion by 1847 in view of his age and heath. In any event, the death of the two Inspectors left a clear field for Jebb, no matter what enemies or what mistakes he may have made. An Act of 1850 enabled the Home Secretary to appoint Directors of Convict Prisons; the job of Chairman went to Jebb, who ended his days as Major-General Sir Joshua Jebb! His monuments, the great radial prisons of the Victorian era are with us today. Pentonville being the first of over 60 such prisons that were subsequently built. Such landmarks as Manchester Strangeways, Leeds, Wakefield, Brixton are a true memorial to Jebb's work. Brixton is known by all staff to be located in Jebb Avenue. His influence on the development of the Prison Service of today is immense. Those of us fortunate enough to have served in a radial prison, marvel still at the simplicity of the design but also its functional appropriateness. It has really never been bettered. Not only was the design so correct it was used extensively in England, it was copied by continental reformers and used extensively in Europe particularly in France and Germany. Bruchsal and Straubing being 2 examples still functioning today. It was further developed in a number of British colonies, particularly Australia where the original `Pentonville design' prison is preserved as a museum. From this short analysis it is clear that the concept of an Inspectorate, of a Head of Works Department are institutions from the early nineteenth century. Even the rivalry and juxtaposition of staff at a senior level for further elevation, are far from new, all is steeped in history.